This article was first re-posted in Havok Journal on 14JAN15. 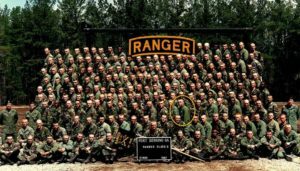 It was late February 1987 in winter Ranger School at Dugway, Utah. After completing our Ranger mission, we looked to the west and saw an enormous winter snow storm approaching rapidly. The Ranger Instructors (RIs) ordered us to road march rapidly to a point 60 kilometers due south. The blizzard struck almost immediately with incredible force. We roped together and continued our force march through the blustering storm. Finally we arrived to a single squad tent with a stove. It was enough room to hold about 11 Rangers like sardines. Each squad would rotate through every hour. The author, during warmer times. I was done, beaten, exhausted. The forced march in the white Mickey Mouse boots tapped every last bit of strength I had left. Since I was carrying the M60 machine gun (AKA “The Pig”), I was put out on the perimeter at the 12 o’clock position near the tent. Like a good Ranger, the moment I laid down, I drifted off to sleep. When I awoke, I was covered by deep snow. It actually insulated me from the cold and allowed me to catch up on some rest. My hands were really cold and wet but I remembered I just got a new set of black winter gloves from my father-in-law before leaving the mountain phase in Dahlonega Georgia! I quickly dug them out and slipped my frozen fingers inside. To my surprise…….there was something hidden in each finger of the glove. What was this? Could it be ? Our prayers had been answered. In each finger of the gloves, my father-in-law hid a dry Lipton soup packet. It was genius ! It was unbelievable. I had 10 soup packets. Enough soup for the whole squad! We soon moved into the warming tent for our rotation and we enjoyed the best hot soup ever. That one simple act of love, warm gloves and hot soup got me through my “breaking point” in Ranger School. To this day I love Lipton Soup and my father-in-law for getting me through.